Orange County Animal Services (OCAS) was recently recognized for their continued service and dedication to the community at the Florida Animal Control Association’s (FACA) annual training and education conference on Feb. 17, 2018. 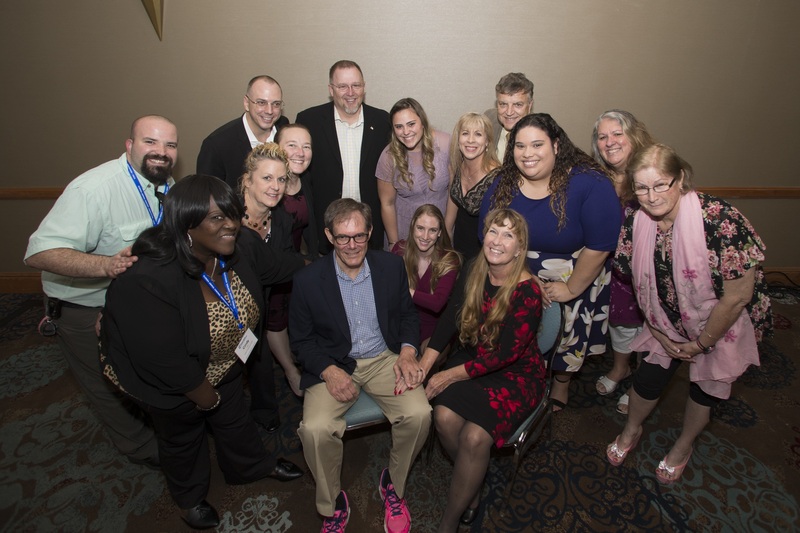 Among the honorees, Dil Luther, Manager of Orange County Animal Services, was presented with the FACA Lifetime Achievement Award for his leadership in developing effective and responsible programs for animals in Orange County. In his 26 years serving OCAS, Luther has seen considerable change, noting the well-deserved shift of the organization’s primary mission of rabies management and public safety to becoming a progressive animal-welfare focused organization. Additionally, Laurie Sepulveda, OCAS Officer, was recognized as the “Animal Control Officer of the Year.” Sepulveda stood out amongst her peers for her eagerness to exceed her daily roles and responsibilities. She began her work with OCAS as an intern in the shelter’s clinic while pursuing her veterinary technician degree. After graduation, she was hired to a full-time clinical position then promoted to animal control officer. During her time at OCAS, Sepulveda has fostered a total of 388 cats and 25 dogs, many of which were being treated for moderate to severe medical issues and would not have survived without her patients and dedication. Sepulveda is now helping plan and lead a future cat-focused initiative for the shelter. Lastly, Vianca Flores, OCAS Administrative Specialist, was named “Employee of the Year.” Flores was nominated for her skilled approach to teamwork, helping coworkers in all areas of the shelter. Shelter staff has noted, the day-to-day tasks of her position very greatly and Flores tackles each with a poise and ease that inspires others. FACA is comprised of the Florida’s public and private animal shelters and is responsible for the training and certification of all animal control officers in the state. The awards presented by the association are especially meaningful to members. As some of the largest champions of shelter animals in their communities, many of their accomplishments go unnoticed. Working with animals can bring many individuals satisfaction, but it is a very challenging profession. OCAS continues to define itself as an industry leader. As the only open-admission shelter in Orange County, the health and well-being of the animals in care is of the utmost importance to the staff. In the recent year, the shelter completed more than 8,000 adoptions, launched a new website and programs, as well as nurtured a dedicated group of volunteers, rescues and a foster homes for pets in Orange County. Photo Caption: Orange County Animal Services wins multiple awards at the Florida Animal Control Association 2018 Conference on February 17, 2018 at the Florida Hotel and Conference Center.